This shelter is located under a home in the Dallas/Fort Worth area. The current homeowner is not the original owner so some details of the shelter, such as when it was constructed, are not known. From the placement of the shelter it must have been built at the same time the garage was built. The shelter is located under the garage of the home. In my opinion this is about as serious as it gets as far as a home shelter goes. I can't imagine how much it must have cost to build this thing. 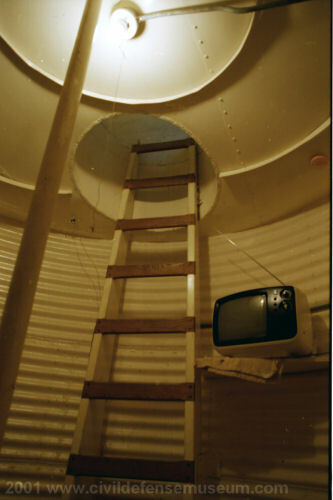 The upper area of this shelter is used regularly by the family today because the ground level concrete room itself is a great saferoom for severe weather and tornadoes. This is the entry door to the shelter. 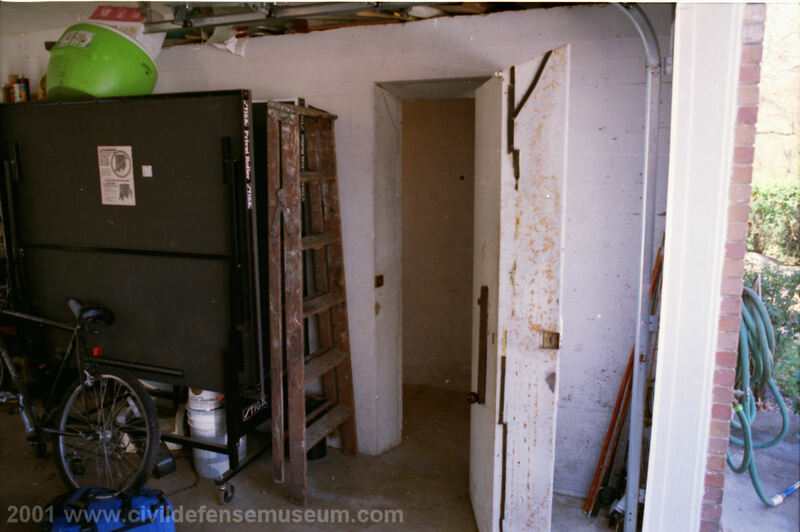 The door opens into a closet sized room with concrete walls that are about 10 inches thick. The door is concrete poured into a wedge shaped metal pan with hinges. The door opens very smoothly with some effort. There is a air vent pipe coming out of the top of the entry and going up through the roof of the garage. 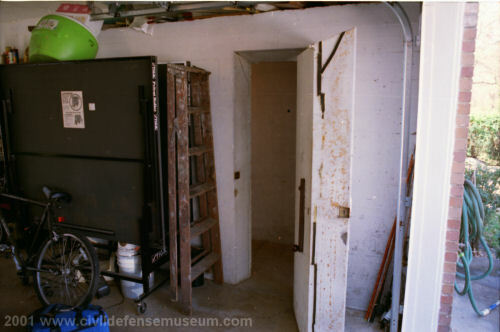 This entry room is located at the end of the garage away from the main house. 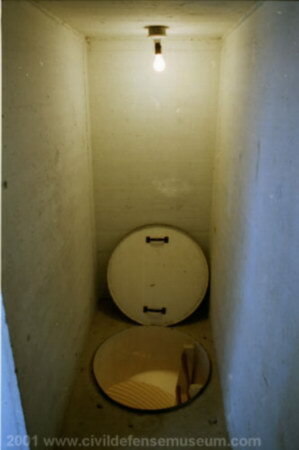 The entry hatch to the underground section of the shelter is to the left through the door. The above left photo shows inside the room looking back at the closed door. The bar on the door swings up and secures with a large bolt to lock the door from the inside. The ground level room is about 3 feet wide by 8 feet long on the inside. The above center and right photos show the hatch on the floor of the room. The hatch is simply a metal cover that goes over the opening in the floor. There is no hinge on the cover, it just lifts up off of the entry pipe coming out of the floor. The entry door to the garage is to the immediate left. This photo was taken looking down the hatch into the shelter below. You can see the curve of the shelter wall at the base of the ladder. The entry to the belowground room is thorugh a metal pipe that connects to the top of the underground room. 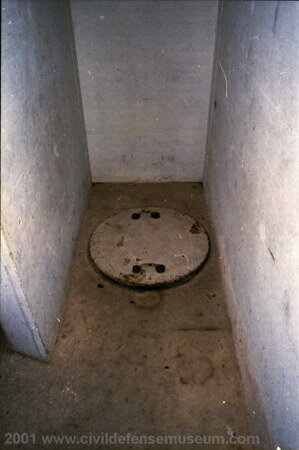 The underground section of the shelter is a round corrugated metal-walled room about 8-10 feet in diameter. It appears to be a small grain storage bin that was put into the ground with concrete poured over it. There is a center pole from the peak of ceiling to the floor. Click All Images To See Larger. The above left photo was taken looking up from the bottom of the ladder. The hatch is closed. Closing the hatch made the shelter feel even smaller. Next to the entry opening there is a single wire coming through a small hole in the ceiling. I assume this wire is some sort of antenna wire to allow radio reception in the shelter. 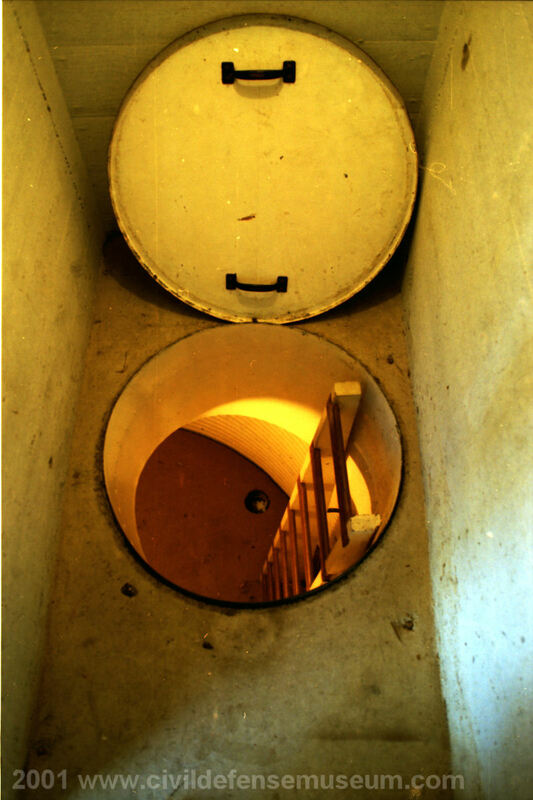 In the above right photo the hatch is open. The reason the photos have different tint is because in some photos I used flash and some photos I didn't use flash. 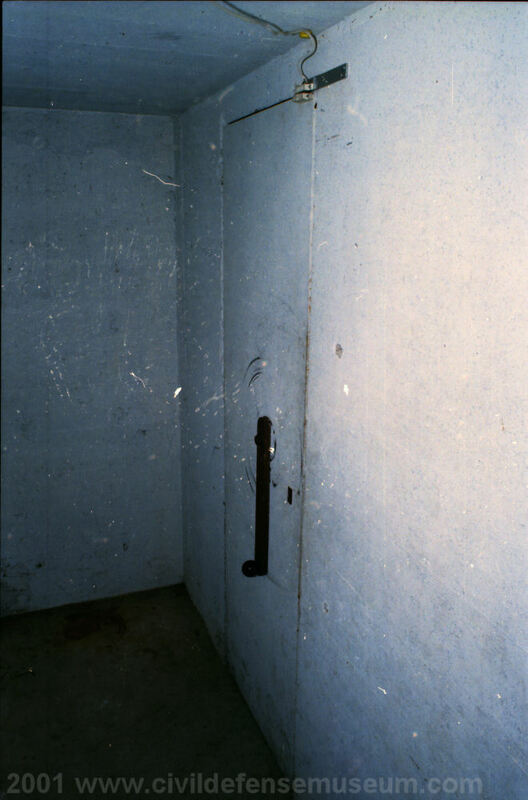 This is a series of three photos which are spliced together that were taken around the room starting at the entry ladder. 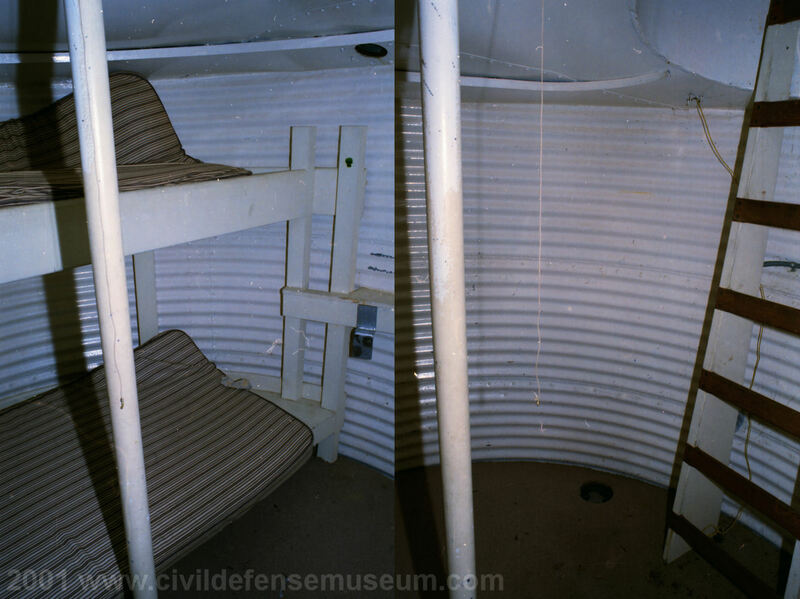 There is a small counter and two bunks built-in on one side of the round room. The large cork-shaped things on the counter are plugs to seal the air pipe openings in the ceiling (see photo at bottom of page). I assume that these were to prevent blast pressure from entering the shelter. 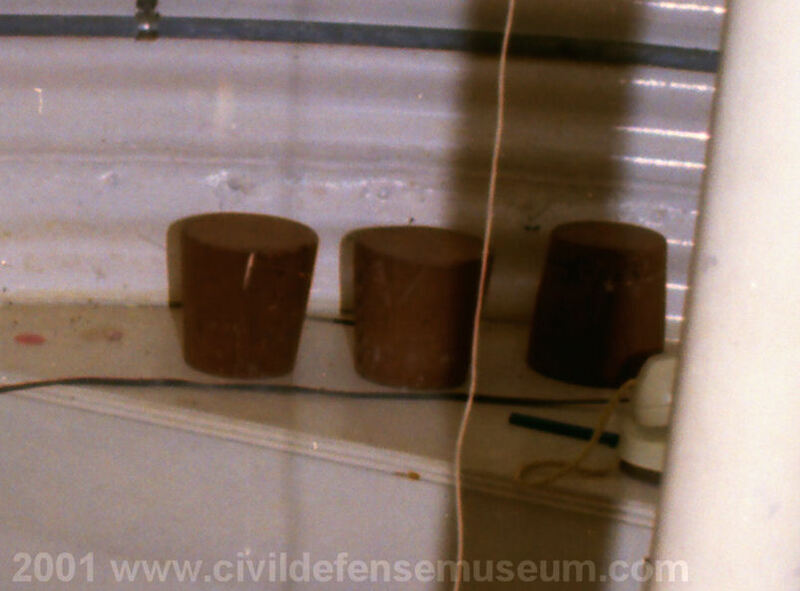 In the center photo, above the fan on the counter, there is a dark circle visible on the ceiling next to the wall of the shelter. This is one of the air pipe openings. This is a series of 2 photos spliced together of the other half of the room. 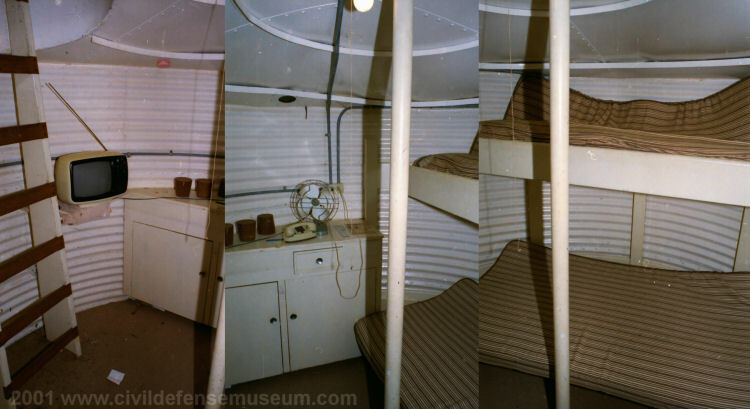 The right photo section shows a metal bracket mounted to the wooden bunk framework. This bracket was where the air ventilation blower mounted. 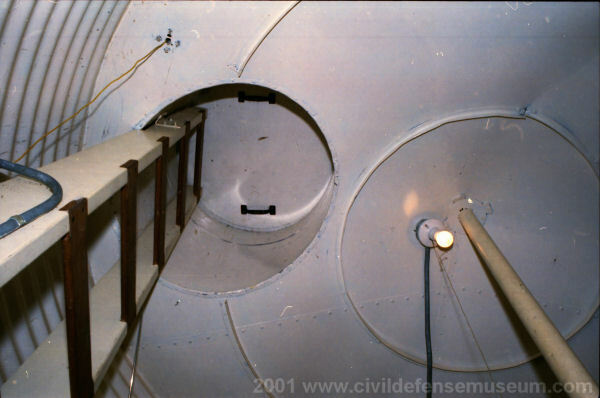 Directly above the metal bracket another air vent pipe opening (dark circle) can be seen on the ceiling. Unfortunately the air ventilation blower was missing. It would have been interesting to operate it and see how much air it would have moved through the shelter. Here's a close-up crop of the above photo of the air pipe seal plugs. I can't remember what they were made of; cork or rubber. They were sized to wedge into the air vent pipes like big corks. These are the air vent pipes outside of the garage. 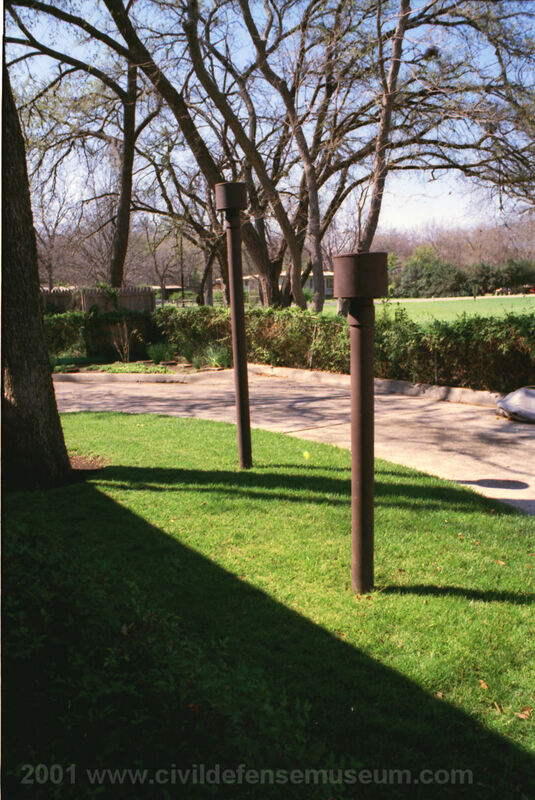 These vent pipes are about 4 inches in diameter, they have large cartridge type air filters underneath the cans on top of the pipes. The tops of the pipes are 5 to 7 feet off of the ground. I'm not absolutely sure which pipe is the air intake. I think it is the far pipe in the photo. That pipe is more inline with the side of the shelter the blower is on. There is also a vent pipe through the ceiling of the entry room that goes up through the roof of the garage. I can't remember if that pipe had a filter or not.